#1.2.1 Why do I need to use cleaning solvents and not water? 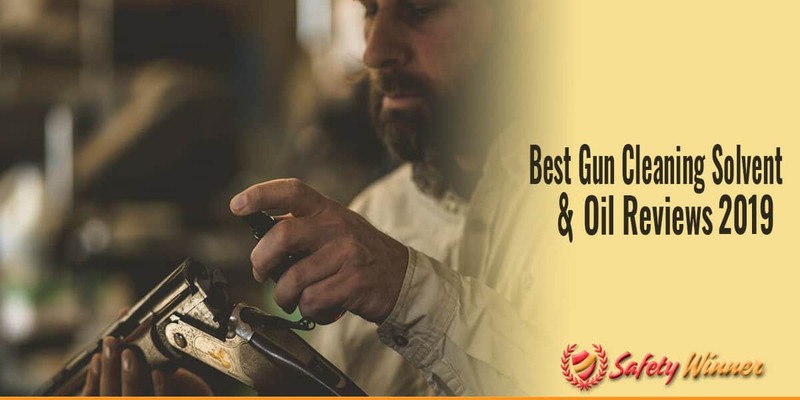 #1.2.2 How to choose the best gun cleaning solvent? #1.2.3 How can I use a cleaning solvent? #1.2.4 Why does some spray have a pungent smell? #1.2.5 How can I store cleaning solvents? As a gun owner, you most likely know that cleaning your gun is extremely important. Contrary to popular belief, you cannot adequately clean a gun with soap and water. Instead, you need a special chemical, such as a solvent, to clean your gun. While most gun cleaning kits include virtually everything you need to adequately clean a gun, they usually neglect to include a top gun cleaning solvent. This is why it’s important to do your own research and find a top cleaning solvent. Since research can take hours and understanding the chemical compositions of each top gun cleaning solvent and oil, we’ve rounded a list of the top ten best cleaning solvents and oils. Check it out below! A truly modern synthetic blend that is specially crafted to keep your gun in the best condition possible. Protects your gun from various conditions, such as excessive moisture, rust, and corrosion. Reduces friction, which ultimately protects your firearm from aging and malfunctioning sooner than the manufacturer estimates. In addition to using this synthetic blend on a firearm, you can use it as a lubricating oil for other outdoor equipment, such as fishing reels. Designed to completely protect your firearm from any wear or tear. The first gun cleaning oil on our list is the Hoppe’s No. 9 Synthetic Blend Lubricating Oil! This gun cleaning lubricant is one of the top selling lubricants on the market. This shouldn’t come as a surprise because Hoppe’s is known as one of the leading gun supply manufacturers in the world. Immediately, this product deserves to be raved about for its secure design. Let’s face it: if someone, such as a child, misuses gun cleaning lubricant, it could cause severe damage and even injury. Hoppe’s understands this, which is why they’ve designed a child proof lid that ensures only you will be able to access the lubricating oil when you need to. The Hoppe’s No. 9 Synthetic Blend Lubricating Oil has a synthetic CLP formulation, which proves to be one of the strongest available. This means the Hoppe’s No. 9 Synthetic Blend Lubricating Oil is specially designed to protect your firearm against anything, such as rust. This synthetic gun cleaning lubricating oil is also good for acting as a protectant for your gun when you plan on storing it for a long time. Long-term storage can be detrimental to your gun, but with the Hoppe’s No. 9 Synthetic Blend Lubricating Oil, you won’t have to worry about your gun aging and rotting away, which would affect its use. Innovative modern non-harsh chemical composition that is non-toxic and even biodegradable. Therefore, it’s safer for your health and the environment than compared to other CLP products. Protects your gun from all minerals, even including those traditionally unprotected by CLPs, such as dust and sand. Helps to regulate a moderate temperature within your gun. Adequately cleans and protects your gun from common conditions, such as rust and crud. The next gun cleaning solvent on our list is the Sage and Braker Mercantile CLP. 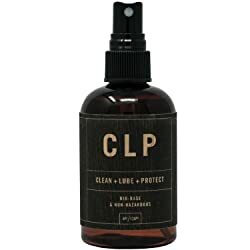 If you’re unfamiliar with CLP, it’s a simple acronym that means “Clean, Lube, & Protect”. In other words, CLP is exactly what you need to adequately clean and protect your firearm. One of the things you should first notice with the Sage and Braker Mercantile CLP is the smell. Unlike other gun cleaning solvents and oils, the Sage and Braker Mercantile CLP actually smells really good. Although this might seem like a minor pro of this product, it’s actually a huge advantage. After all, no one wants to deal with the headaches of working with a pungent product. Aside from the fact the Sage and Braker Mercantile CLP smells good, it’s one of the strongest and most effective gun cleaning solvents on the market. The potential of this product is no joke. In other words, it effectively cleans your gun in the shortest amount of time. We even discovered that you only have to use this solvent half the regular time that you normally would need to clean a gun. It’s also helpful that this gun cleaning solvent is completely versatile. Most gun cleaning solvents require you to either use a bore or a brush. But, with the Sage and Braker Mercantile CLP, you can use whatever cleaning tool you please! One of the biggest advantages of the Sage and Braker Mercantile CLP is that it’s composed with a secret comprehensive solution that protects your gun from dust, unlike other CLPs. So, you won’t have to worry about cleaning dust off your gun every time you want to use it. This also helps the gun maintain good condition for a longer time. A comprehensive and advanced solution that truly makes it easier and quicker to adequately clean your firearm. Comprehensive chemical solution, which isn’t pungent and has biodegradable and even non-toxic qualities. In other words, this is one of the safest gun cleaning solutions to work with. Targets carbon and other minerals from the core, which ensures they are completely removed and won’t build up again. Between this solvent’s cleaning composition and protectant qualities, your firearm will have an improved rate of reliability, as well as accuracy. In other words, it will be in the best condition possible. Third on our list is the Prom Hoppe’s M-Pro 7 Gun Cleaner. Like previously stated, Hoppe’s is a leading gun cleaning solvent manufacturer. So, it shouldn’t be a surprise that they’re featured on this list more than once. The Prom Hoppe’s M-Pro 7 Gun Cleaner is primarily raved about because it has a military-grade composition. 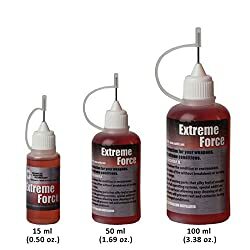 In other words, this gun cleaning solvent is designed to use with even the most professional firearms that military professionals use, which means it will more than adequately clean your standard firearm. One of the nicest features of the Prom Hoppe’s M-Pro 7 Gun Cleaner is its easy to use design, which comes in a classic spray bottle that features a safety switch, so you don’t have to worry about accidentally spraying the cleaning solvent when you don’t mean to. The next phenomenal feature of the Prom Hoppe’s M-Pro 7 Gun Cleaner is its innovative chemical composition, which ensures every ounce of carbon is removed from your firearm. This contrasts traditional gun cleaning solvents, which only seem to focus on the surface level of carbon. This means the Prom Hoppe’s M-Pro 7 Gun Cleaner solution is designed to clean every ounce of carbon and other minerals from your gun to ensure that there isn’t anything left over that will build up over time. This creates a smooth and clean bore, which promotes optimal condition and use. Surpassed American Standard for Tests and Measurements standards with an “Excellent” score. Comprehensive multifunctional solution, so you don’t have to worry about purchasing multiple products to clean, protect, and lubricate your firearm. High-density composition and thin solution make it extremely easy to use and manipulate. Dense cleaning properties evaporate, so a thin layer of protectant and lubricated qualities remain to keep your firearm in the best condition possible. If you want a truly comprehensive gun cleaning solvent, then look no further because the Eezox Premium Synthetic Gun Care is your solution. Eezox Premium Synthetic Gun Care has all the qualities you need that typically come in two or three gun cleaning solvents. This means you only have to purchase and use the Eezox Premium Synthetic Gun Care and nothing else. Eezox Premium Synthetic Gun Care’s composition is simple. This gun cleaning solution has an innovative composition that promotes cleaning, protection, and lubrication. So, you can use Eezox Premium Synthetic Gun Care during every step of the gun cleaning process. Despite the fact thatEezox Premium Synthetic Gun Care has a high-density composition, the solution itself is actually pretty loose and thin. This makes it extremely easy to use and manipulate while you’re cleaning your gun. After thoroughly cleaning your firearm, simply apply a thin coat of Eezox Premium Synthetic Gun Care. You don’t have to worry about wiping it away because the heavy solvent qualities of the Eezox Premium Synthetic Gun Care will simply evaporate away and leave the important lubricant qualities on your firearm. These lubricant qualities will ensure your firearm remains in tip-top condition and runs smoothly and effectively. In other words, you won’t have to worry about your gun rusting or accumulating dust and other minerals. Innovative synthetic composition that’s non-pungent, non-flammable, and completely biodegradable. Therefore, it’s easy to work with and great for the environment. Targets the foundations of carbon, and other minerals, so you don’t have to worry about leftover materials creating future build up in your gun. Unlike other bore cleansers, you can use this one on virtually every gun material, such as steel, plastic, anodized aluminum, and even rubber. Creates a sleek and smooth finish that also protects your gun from various things, such as rust and damage due to old age. Although Hoppe’s produces a variety of gun cleaning products, the Hoppe’s No. 9 Synthetic Blend Gun Bore Cleaner is their top-selling most raved about product. In fact, the Hoppe’s No. 9 Synthetic Blend Gun Bore Cleaner is one of the best bore cleaners currently on the market. Using the Hoppe’s No. 9 Synthetic Blend Gun Bore Cleaner makes cleaning your firearms extremely easy. In fact, the whole process only consumes a few seconds. Simply dip a little bit of Hoppe’s No. 9 Synthetic Blend Gun Bore Cleaner onto a bore snake, then use it as you would to clean your firearm. Once you dip the bore snake into your gun, the Hoppe’s No. 9 Synthetic Blend Gun Bore Cleaner begins to work its magic. The process is simple, the cleanser begins working by targeting the foundations of the carbon that’s built up in your gun. Then, it makes sure that the carbon and all the other harmful chemicals and minerals are removed. Another great aspect of the Hoppe’s No. 9 Synthetic Blend Gun Bore Cleaner is its subtle smell. Contrary to other bore cleaners, the Hoppe’s No. 9 Synthetic Blend Gun Bore Cleaner doesn’t have a pungent smell that will give you headaches and make it hard for you to clean your gun. Instead, you can clean your gun anywhere at any time, and no one will notice the smell. Innovative and modern DynaGlide Plus solution that is multifunctional and ensures your gun is clean, protected, and lubricated. Easy to spray design with a safety lock feature, so you don’t have to endlessly fumble with the cap to use the spray, as well as have peace of mind knowing you won’t accidentally spray it when you’re not cleaning your gun. Non-tacky, thin, and dry solution that makes it extremely easy to use and manipulate. Targets carbon and other grime from their roots, so your gun is completely clean and you don’t have to worry about future build up. Like stated in the name, the Hornady 99901 One Shot Gun Cleaner is the ultimate gun cleaning solution for people who only want to have to use one gun cleaning products instead of one or two products. Let’s face it: it’s easy for guns to accumulate a variety of things, such as lubricant, carbon, and other minerals. When this happens, guns begin to malfunction and could even be damaged. That’s where a renowned gun cleanser, like the Hornady 99901 One Shot Gun Cleaner steps in. With the Hornady 99901 One Shot Gun Cleaner, the innovative modern formula initially starts working by targeting the origins of carbon and the other minerals that build up inside guns. This makes sure that any grime is completely cleaned from your gun, as well as ensures that no further carbon or grime will not accumulate inside your gun. In addition to being a cleanser, the Hornady 99901 One Shot Gun Cleaner is also a lubricant. Contrary to other popular gun lubricants, the Hornady 99901 One Shot Gun Cleaner has a non-tacky thin quality that works smoothly by targeting fouling. This ensures your gun remains smooth, clean, and in the best condition possible. Cleans, lubricates, and protects your firearm from a variety of conditions and minerals. Innovative modern light solution ensures that it’s easy to use and manipulate while you’re cleaning your gun. Using the Gunzilla 16oz Turret Top makes cleaning your gun easier and quicker. You don’t have to worry about cleaning out excess product in your gun once it’s clean. In addition to being a gun cleanser, this product is great to use on a variety of outdoor products, such as pocket knives. 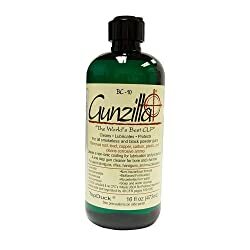 One of the most recently popular gun cleaning products is the Gunzilla 16oz Turret Top. This is largely due to its innovative chemical composition that ensures deep penetration for targeting things, such as carbon, minerals, and other common grime. One of the highlighted features of the Gunzilla 16oz Turret Top is the lightness of the solution. Some gun cleaning solvents are thick and hard to manipulate, which ultimately makes cleaning your gun long and difficult. But, since the Gunzilla 16oz Turret Top has a thin and light composition, cleaning your gun takes little effort and time. When using the Gunzilla 16oz Turret Top, all you need to do is place a little bit of it onto a cotton swab or a Q-tip and move it back and forth within your gun. Contrary to other gun cleaning solvents, you won’t have to do this process more than once. Also, you won’t have to worry about removing any excess solution. Unlike other types of gun cleaning solvents, the Gunzilla 16oz Turret Top ensures that every bit of carbon and grime is cleared from your gun. This ensures that your gun is in the best condition possible and can adequately operate. Also, you won’t have to worry about any leftover residue remaining and blocking up your gun in the future. Comprehensive CLP solution, which means this product has a diverse and modern composition so your gun is adequately cleaned, lubricated, and protected. A solution completely made out of ingredients that are bio-based and non-toxic, so you don’t have to worry about working with strong fumes. Phenomenal USDA and MIL-SPEC Technical certifications. You can use this solution anywhere at any time. Targets carbon, grime, and other minerals from their roots, so they don’t continuously build up inside your gun. By now, you should understand the importance of purchasing a gun cleansing solution that has CLP properties, such as the Grizzly Grease Non-Toxic CLP. With CLPs, like the Grizzly Grease Non-Toxic CLP, you don’t have to worry about purchasing a variety of products just to clean, lubricate, and protect your firearm. One of the most highlighted features of the Grizzly Grease Non-Toxic CLP is the fact it exponentially surpasses USDA Certification, as well as MIL-SPEC Technical Standards. In other words, the Grizzly Grease Non-Toxic CLP is good enough to be used on professional firearms that even the military use. 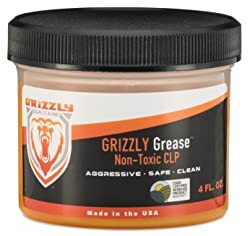 If the Grizzly Grease Non-Toxic CLP is good enough to clean military grade firearms, then it is more than durable enough to adequately clean your standard firearm. The Grizzly Grease Non-Toxic CLP solution has a modern composition that targets things, like corrosion and carbon, directly from the source. This means that you don’t have to worry about grime and other minerals rebuilding inside your gun and causing further damage, which could ultimately lead to malfunction or speed the aging process of your gun. Another great aspect of the Grizzly Grease Non-Toxic CLP is the fact it can be used in virtually any weather condition, such as a hot desert or even the cold Arctic. This is different than other CLP solutions, which usually require you to use them in a moderate climate or they won’t work. Features a safety cap, which ensures the liquid doesn’t leak and is inaccessible when you’re not cleaning your gun. Dropper tip makes it extremely to use the product while you’re cleaning your gun. Long lasting, extreme force solution that is thin and smooth. This means it’s extremely easy to utilize and manipulate this solution while you’re cleaning your gun. Doesn’t stick or harden like other gun oils, so you don’t have to worry about cleaning excess and preventing residue. Completely cleans carbon, rust, and other minerals. Although this is predominately a gun oil, it can be used for other outdoor equipment, such as fishing reels. If you want an easily accessible gun cleaning solution bottle that is long lasting, then look no further because the Advanced Weapons Technology Gun Oil is the gun solvent for you! Advanced Weapons Technology is one of the leading manufacturers in the firearm industry, so it shouldn’t be a surprise that their top-selling gun oil is on our list. The Advanced Weapons Technology Gun Oil utilizes an extreme force solution that ensures your gun is properly lubricated and protected for future use. In other words, with this gun cleaning solution, your gun will have adequate lubrication and protection that ensures no minerals or things, such as carbon, penetration or spread throughout your gun. As for the consistency itself, the Advanced Weapons Technology Gun Oil solution has a smooth and thin consistency, which means you don’t have to worry about this gun solvent hardening inside your gun while you’re cleaning it or leftover residue that will build up. The Advanced Weapons Technology Gun Oil is also fast acting. This means you don’t have to spend as long as you normally would cleaning your gun. Instead, this gun cleaning solution reduces the total amount of time it takes to clean your gun by half. Ultimately, this makes cleaning your gun more efficient and quick. Features a non-toxic, bio-preferred chemical composition that is thick and aggressive. Preferred CLP by the USDA, military professionals, and law enforcement. Thick design makes this CLP solution easy to see while cleaning. Subtle smell, which makes it easier and safer to clean your gun. Lubricant qualities leave your gun shiny clean and safe from any damages, such as built up products and quicker aging. The last gun cleaning solvent on our list is the Grizzly Lube Non-Toxic CLP! This gun cleaning solvent definitely lives up to its name in the sense that it has a completely non-toxic composition and is a true CLP. In other words, this gun cleaning solvent ensures your firearm is adequately cleaned, lubricated, and protected. The unique chemical composition not only surpassed the USDA certification with flying colors, but is also preferred by military professionals and law enforcement. This is a huge indicator that the Grizzly Lube Non-Toxic CLP is prepared to adequately clean, lubricate, and protect any kind of standard firearm. More specifically, the Grizzly Lube Non-Toxic CLP has an ultimately aggressive and thick consistency, which ensures your gun is rid of any minerals and products, such as carbon. Contrary to other thick gun cleaning solvents, the Grizzly Lube Non-Toxic CLP doesn’t stick or leave any extra residue. Another great aspect of the Grizzly Lube Non-Toxic CLP is the subtle smell. While most aggressive CLP solutions have a strong pungent smell, the Grizzly Lube Non-Toxic CLP is made with bio-preferred products, which means the smell of the chemical composition is essentially inexistent. This makes it easier and more enjoyable to clean your gun. #1 Why Do I Need to Use Cleaning Solvents and Not Water? Contrary to popular belief, using water to clean your done barely cleans your gun. In fact, most of the time it actually doesn’t do anything but further damage your gun because water rusts the metal materials of your gun. On the other hand, gun cleaning solvents are specially crafted with innovative strong chemicals that won’t harm your gun. Instead, these chemicals actively work to adequately clean, protect, and lubricate your gun, so it stays in good condition for a long time. #2 How to Choose the Best Gun Cleaning Solvent? The type of equipment you’re using. For example, a bore snake works better with comprehensive CLPs than different kinds of cleaning equipment. Whether you want a comprehensive CLP, so you don’t have to purchase multiple solvents, or a simple solvent solution. Whether you want a thicker solution for quicker results, or a thinner solution that’s easier to manipulate. #3 How Can I Use a Cleaning Solvent? Using a gun cleaning solvent is actually easier than it seems. Typically, all you have to do is integrate it into your regular gun cleaning routine. But, it’s important to make sure that you’re using your gun cleaning solvent properly. So, make sure to check the instructions that are usually located on the back of the solvent bottle. #4 Why Does Some Spray Have a Pungent Smell? Some gun cleaning solvents are made with harsh chemicals. While these harsh chemicals are often military grade and will more than adequately clean your gun, they are so potent and strong that they create a pungent smell that ultimately makes it hard to work with. Luckily, most modern day gun cleaning solvents are made with biodegradable chemicals that are not only beneficial for the environment, but create a better working environment because they have little to no smell. #5 How Can I Store Cleaning Solvents? Since gun cleaning solvents are made with advanced and innovative chemicals, it’s important that you properly store your gun cleaning solvent when it’s not in use. Luckily, most gun cleaning solvents come in secured containers. So, at least you don’t have to worry about securing the product while it’s not in use so it doesn’t spill or accidentally harm someone. Generally speaking, you should keep your gun cleaning solvent with the rest of your gun cleaning products. Furthermore, all of these products should be stored in a safe and temperature regulated room, such as a closet or garage.